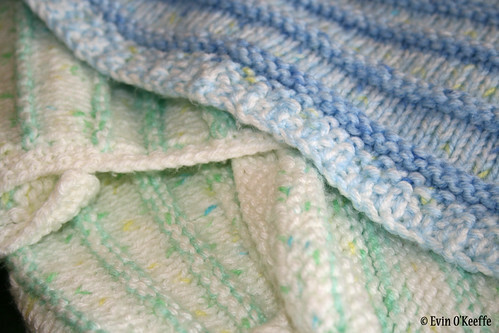 You may remember reading about my Stripy Cozy Baby Blanket (it’s a free knitting pattern). I have knit a few of them as gifts. It is knit with doubled-up DK yarn, which makes it a quick knit with an interesting color pattern that varies depending on the yarns used. This gives you a lot of control. The combination of stockinette, seed stitch, and purl rows creates a satisfying and sensory texture as well (and helps it lay flat). Each hand-knit blanket takes about 750 yards of double-knit wool (325 yards in each color DK), 18-22 hours of knitting, and a bit of time for planning and finishing (weaving in loose ends, washing, wrapping, mailing…). In addition to soft acrylic yarn, it is made with love. But the result is worth it because it lasts and is squishy. It is a tough choice between waiting until the gender is discovered to start a blanket project and starting early with a gender-neutral hue combination. 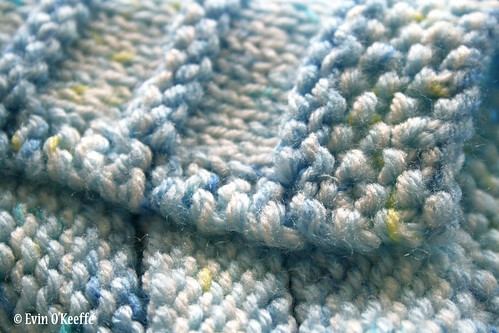 The Blue Skies Blanket has different shades of blue with bits of cream and flecks of yellow. The Vanilla Mint Chip Blanket is green and cream for a surprise baby gender. Green or yellow seem to be classic colors for gender surprises. Yellow does seem more feminine and green slightly more masculine, but combining them with each other or with a hue that is not pink or blue might lend further neutrality, girlish grace, or boyish charm. Here are some of the color combinations I have in my sketchbook. NEUTRAL: Shades of Green; Shades of Yellow; Green & Yellow; Yellow & Orange; Green & Gray; Yellow & Gray; Orange & Gray; Aqua & Yellow; Aqua & Gray; Aqua & Green; Gray & White; Dark Navy & White; Red & White; Aqua & White; Green & White; Red & Yellow; Yellow & White; Orange & White. GIRL: Shades of Pink; Shades of Lavender; Green & Pink; Green & Lavender; Pink & Brown; Pink & Yellow; Pink & Orange; Pink & Navy; Lavender & Pink; Lavender & Gray; Pink & Gray; Pink & Red; Pink & White; Lavender & White. BOY: Shades of Blue; Green & Blue; Green & Navy; Blue & Navy; Green & Black; Aqua & Navy; Aqua & Blue; Blue & Gray; Blue & Yellow; Blue & Brown; Orange & Brown; Black & Blue; Green & Brown; Navy & Gray; Blue & Orange; Navy & White; Navy & Yellow; Blue & White. What colors would you knit it in? 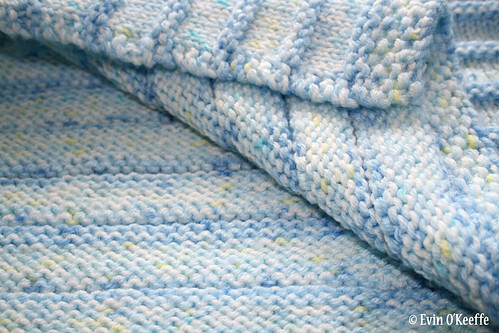 This entry was posted in Knitting for Babies & Kids, My Knit Patterns, Tutorials | Patterns and tagged baby blanket, free knitting pattern, free knitting patterns.